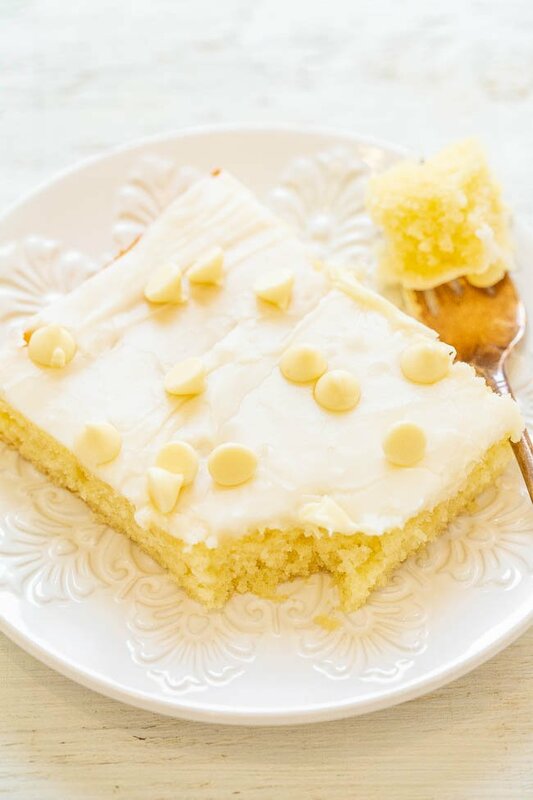 White Chocolate Texas Sheet Cake – A fast, EASY, no-mixer cake that’s soft, fluffy, tender, and just melts in your mouth!! 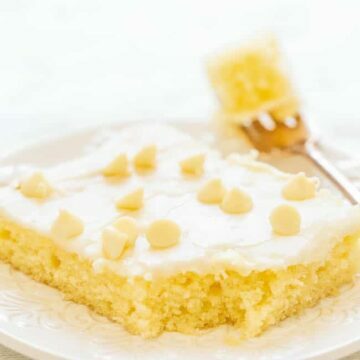 The white chocolate twist on a traditional Texas chocolate sheet cake is DELISH! A perfect PARTY cake!! 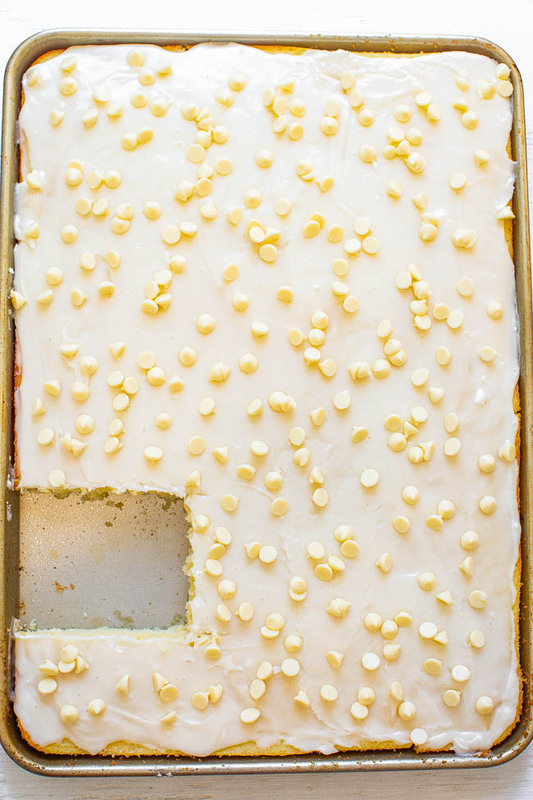 Everyone thinks of chocolate cake when it comes to a Texas sheet cake but I decided to make a white version that’s studded with white chocolate chips. This is a fast and easy cake and you don’t even need to use a mixer. Just whisk everything together which is my idea of a perfect cake. The cake is soft, tender, fluffy, moist, and everything you want in a white cake. I don’t often make sheet cakes because truthfully I don’t need that much cake laying around. But I had out of town guests coming and I knew that it would be the perfect opportunity to make a big ‘ole Texas-sized cake. My daughter said the cake gets a 10 out of 10 and everyone loved it. There is almond extract in the batter but I really didn’t taste it much in the finished cake. If you’re an almond extract lover, I would go heavier handed when adding it to the batter. I prefer almond to vanilla extract in desserts like this, especially with white chocolate involved. It really is a better choice in my opinion than vanilla extract but do as you see fit. 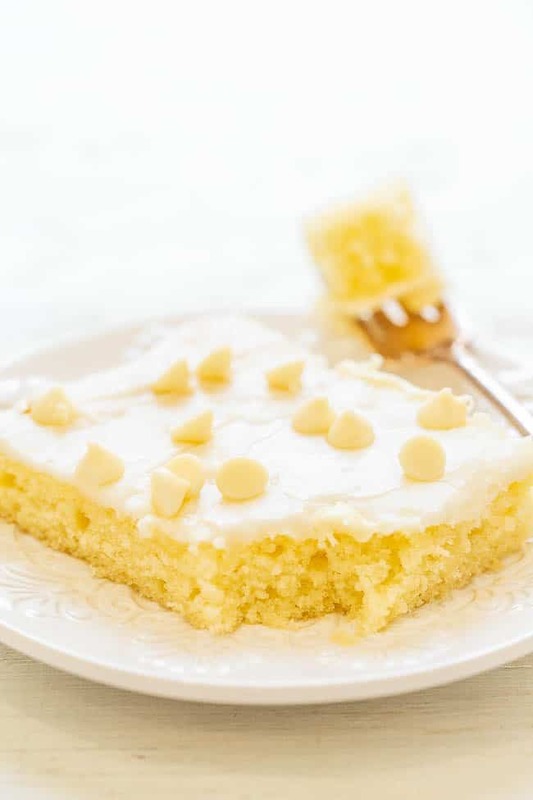 I adapted the cake from this recipe and cut back on the confectioners’ sugar by a full cup after reading some reviews that stated it was too sweet as written. The original recipe calls for 4 1/2 cups confectioners’ sugar and I added 3 1/2 cups and that was plenty. If I were to made this cake again, I would add 2 1/2 cups, see how it tastes and what the texture is like, and if necessary go up to 3 cups total, but not more. The white chocolate chips add visual appeal and also add sweetness. If you’re not a white chocolate person, you can always adds nuts, sprinkles, or just omit. The first thing I always wonder when I when I see sheet cake recipes is can I halve it? As I mentioned before, I don’t make them often because I don’t need so much cake all at once usually. I like to fit into my clothes. With this recipe, while I haven’t personally tried it, I think you would be fine halving it and baking it in a 9×9-inch pan. The baking time may vary slightly but it should be close. 35 BEST Easy Cakes – Whether it’s a birthday cake, anniversary cake, or a just-because cake, you’ll find the perfect EASY cake here!! Only the BEST recipes including chocolate, fruity, pumpkin, red velvet, and more! Easy Homemade Funfetti Cake with Vanilla Buttercream – Move over storebought cake mix! This easy cake only takes minutes to make and tastes wayyyy better! Buttery Crumb Coffee Cake – A soft, fluffy cake with cinnamon-brown sugar streusel crumbs and a perfectly sweet glaze! An easy coffee cake that’s perfect for brunch, holidays, or anytime you’re craving cake! Cake – Preheat oven to 375F. Spray a 15x10x1-inch very well with floured cooking spray or grease and flour the pan; set aside. To a large mixing bowl, add the first 5 ingredients and whisk to combine; set aside. In a small saucepan, combine the butter, water, and bring just to a boil. Stir it into the flour mixture. To a small bowl, add the eggs, sour cream, almond extract, and whisk well to incorporate. Stir it into the flour mixture. Transfer batter to prepared pan and bake for about 16 to 17 minutes, or until done and a toothpick inserted into the center comes out clean (Note – the original recipe states to bake for 18 to 22 minutes however in my oven that would have been far too overdone and burnt); always bake until done whatever that means in your oven. Allow cake to cool in pan on a wire rack while you prepare the frosting. Frosting – To a medium saucepan add the butter, milk, and bring just to a boil. Turn off the heat and add the confectioners’ sugar, almond extract, and whisk well to incorporate until smooth. Quickly turn frosting out over the cake, smoothing it lightly with a spatula. Frosting will set up quickly. Evenly sprinkle with white chocolate chips before serving. Cake will keep airtight at room temp for up to 5 days. I am comfortable storing frosted desserts at room temp. If you are not, store in the fridge noting the cake will be more prone to drying out. The original recipe calls for 4 1/2 cups confectioners’ sugar. I used 3 1/2 cups based on reviews people left saying at 4 1/2 cups the frosting is both too sweet and too stiff and 3 1/2 cups was indeed plenty. If I were to make this frosting again, I would add 2 1/2 cups confectioners’ sugar, taste the frosting and check for consistency, and if necessary add another 1/2 cup for a total of 3 cups at the maximum. I am a fan of almond extract which is so good paired with white chocolate! I also like the idea of adding toasted nuts tothe frosting but can’t decide between walnuts or pecans. The pairing is delicious and you can’t go wrong with either pecans or walnuts! This cake looks incredible! I know what I’m making for Sunday night dessert! Yes but I prefer almond here. I too found the need to cut back on confectioners sugar but use pecans on top so as to not add more sugar back in & to add texture. Walnuts tend to have a stronger taste to me & I did not want to overwhelm the almond flavoring. Excellent recipe. Won a blue ribbon at the fair with it. Thanks for the 5 star review and glad you also enjoy this cake and agree about cutting back on the sugar in the frosting. I was making this for a group with someone who had a nut allergy so I had to avoid nuts but I agree with what you said. Yay and glad you can have this! looks good but is way to much to be finished in 5 days. how well will this this cake hold up in the freezer? It depends if you are entertaining or not which is when/why I would make this cake. I would not make it for a small group. I don’t know how it will freeze since I have not tried. This cake was a hit at a small buffet supper last night. I made the recipe using 3 cups of confectioners sugar (just enough sweetness for the group) and topped it with white chocolate bits. Because it was a small group of people, I divided the recipe between 2 8X8 square cake pans so I could bring one to the supper and still have some for home. Baking time was approximately 25 minutes, in my oven. Perfect! and YUMMY!! Thanks for the 5 star review and glad that 3 cups of confectioners sugar was perfect and good thinking about doing two 8×8 pans! Glad it was a hit!